The children rescued from the orphanage in Pasighat. 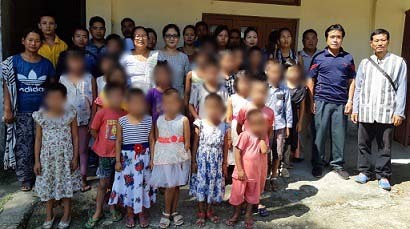 Arunachal Pradesh State Commission for Women (APSCW) and AP State Commission for Protection of Child Rights (APSCPCR) on Thursday rescued 22 children from an orphanage in Pasighat. Pasighat, the district headquarters of East Siang is around 270 kms from here. A team led by APSCW Member Secretary Yame Higio and Tem Yabi along with East Siang district’s Child Welfare Committee rescued the children. The rescue operation took place following information received from P.E. Angu, ISDC Deputy Director and DCPO District Child Protection Unit of East Siang. The action was initiated after an inspection by the CWC East Siang on Friendship Foundation Academy, an unregistered orphanage and school established without the knowledge of the local authorities. The academy is said to have its head office in Itanagar and most parents came to know about this school by word of mouth. The children belonging to areas adjoining district headquarters Pasighat were asked to return to their parents/guardians while those from Papum Pare, Kra-Dadi and Kurung Kumey districts were brought to Children Home run by Oju Welfare Association (OWA) in Naharlagun, an official said. A report submitted by Obang Dai, Chairperson of CWC Pasighat to the East Siang deputy commissioner recommended closure of the home on violations of the Juvenile Justice Act, 2015. The home had no registration of any kind and had enrolled 50 children. The living condition of the five-room hostel was also found to be deplorable and no furniture was found in the classrooms. Nine to 10 children used to sleep in a room on two small beds joined together. Classes were conducted for just one or two hour a day. The rooms were without any ventilation and very unhygienic, a report said. Most of the children also showed signs of skin infections. The children were also underfed with just two meals a day of rice and dal only while tap water was provided for drinking, the report said. Laxmi Chhetri Yirang has been the school in-charge since taking over in March from one Priyanka from Darjeeling. The teachers were also not paid their monthly salary for past three months and two teachers and the cook left the school. An FIR has been lodged at Pasighat Police Station against Friendship Foundation Academy’s Chairman Karma Bhutia, who is absconding. The 22 children were brought to the Children Home in Naharlagu on Wednesday at 10.30 pm and handed over to their parents after being called for a meeting at OWA on Thursday. However, considering the present situation and due to the mid-school session, the SCPCR requested OWA Chairperson Ratan Anya for admittance of the children in Oju Mission School (OMS). 19 children were admitted to OMS out of whom four were found to be orphans and three were taken back by their parents. OWA would provide free education to all the children for this session. APSCW and APSCPSR appreciated CWC team Pasighat and Anya for their prompt action and support for rehabilitating the children. The State government was also requested to constitute a separate commission for SCPCR to look after children-related cases as a number of crimes against children are taking places in the State.